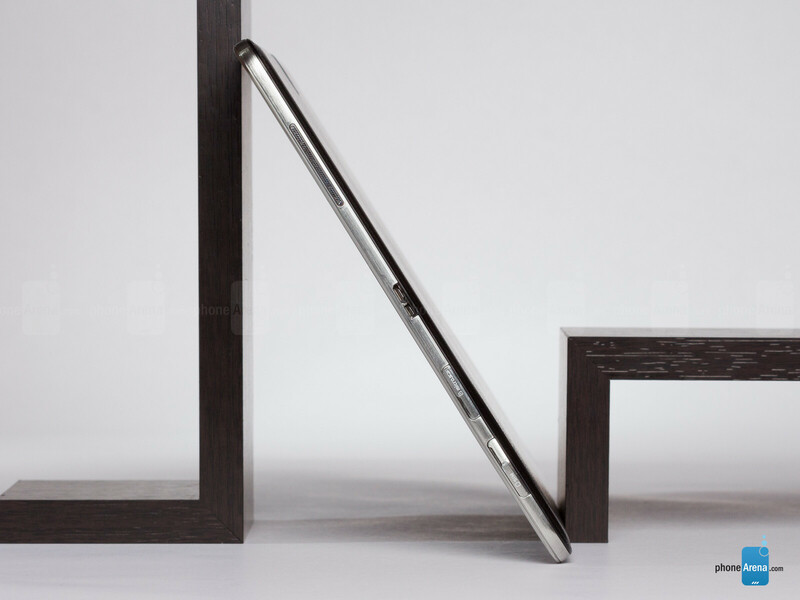 Samsung started the craze for big-sized devices back in 2011 when it supersized the smartphone with the launch of the Galaxy Note, creating a whole new class of devices we now often refer to as ‘phablets’. 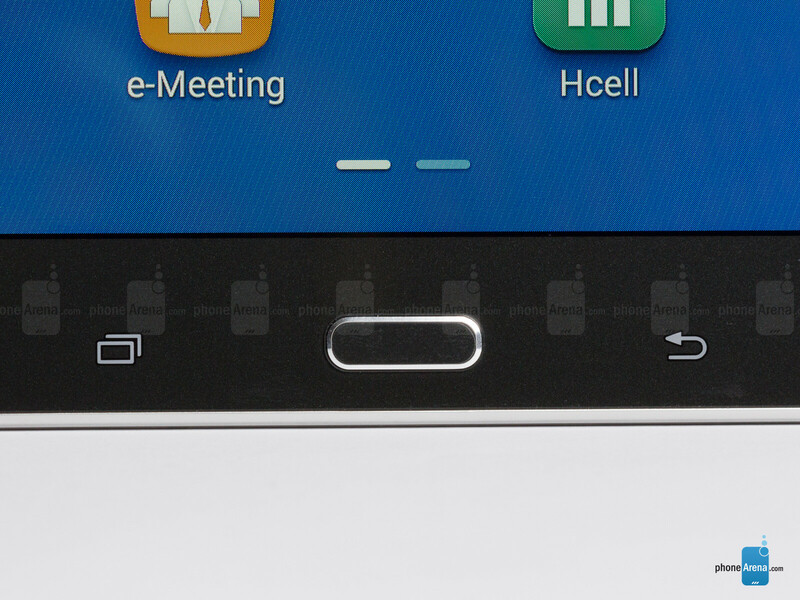 Phablets, as the name suggests, are devices crossing the border between a ‘ph’one and a t’ablet’. Users loved the phablet idea and in just three years, the Note phablet series have become Samsung’s most successful and profitable product. Now, in 2014, the company has clearly decided it’s time to do the same with its tablets - supersize them. The Samsung Galaxy Tab Pro 12.2 is one of the first of this kind - a 12.2-inch tablet bigger than all other slates out there. It’s almost as big as a laptop, and with the word ‘Pro’ in its name, there’s a clear lean towards business and productivity. So can Samsung succeed again with a big sized device? And can this new 12.2-incher make the coffee shop your new office? Finally, is the Galaxy Tab Pro 12.2 the start of a new era of crossover devices between tablets and laptops; is it the first ‘tabtop’? On paper, Samsung has checked all the boxes - an extremely sharp, 2560 x 1600-pixel display, a powerful Exynos 5420 octa-core chip under the hood, and the latest Android 4.4 KitKat adorned with a brand new user interface that Samsung calls Magazine UX. There are also two versions of the tablet - a Wi-Fi only one that’s cheaper, and a more expensive one featuring 4G LTE connectivity. We have an early version of the Tab Pro 12.2, and we can get an early glimpse at how this all comes together. Let's go. It’s seriously big - almost the size of a food tray, but it’s also well put together boasting a nice faux-leather back and a thin profile. If back in 2010, the iPad was ridiculed for being nothing but a stretched out iPhone without a phone function, now, in 2014, someone could easily make the same point for the Galaxy Tab Pro 12.2. 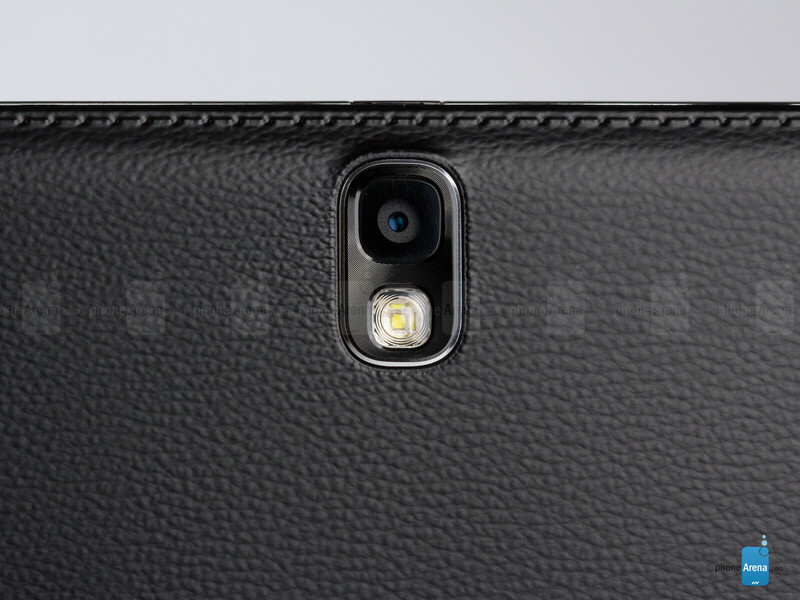 With a familiar fake leather faux-stitched finish, it looks just like an oversized Galaxy Note 3. Thankfully, the faux-leather finish feels nicer to hold than the glossy plastic Samsung has previously used, and it catches less grease and fingerprints. With that said, the elephant in the room remains the fact that this is one huge device. Measuring 11.6 inches wide and 8 inches tall, we imagine one could use this as a food tray just for the fun of it - it’s certainly large enough. The Tab Pro 12.2 is, however, not just large - it’s also an excruciatingly heavy device. At 1.6 pounds (732g), it’s not meant to be held in one hand, and we found it tiring to hold even with two hands for longer periods of time. Actually, the most convenient way to use the Tab Pro 12.2 is a bit like a laptop - rest it on a table or on your lap, but unlike a laptop you have to support it with your hand. It’s clear that the Tab Pro 12.2 does not have any direct competitors - it’s the first tablet with such a large display - but if we had to compare it to a device like the iPad Air, we’d point out that both are remarkably thin and ‘airy’. Samsung’s tablet is still a hair thicker at 8mm (0.31”), but the difference is really negligible. 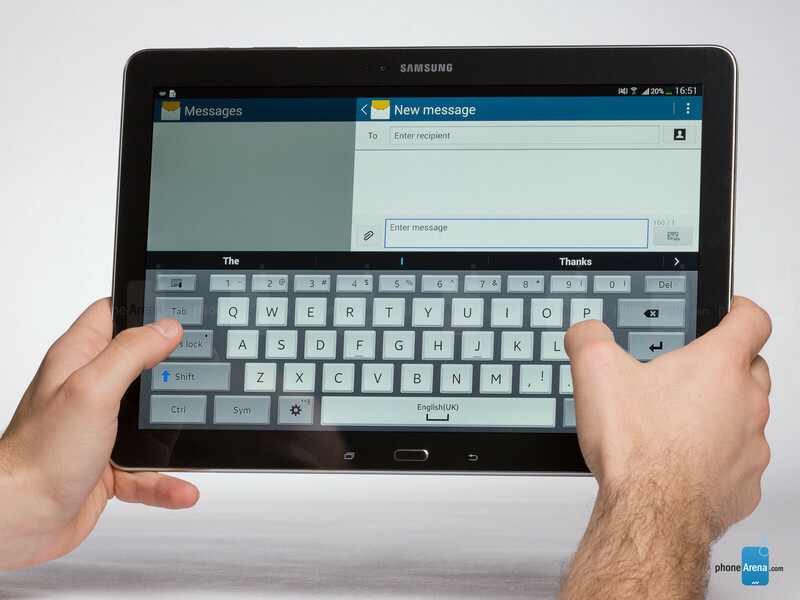 The Tab Pro 12.2 comes without on-screen buttons and instead features the traditional for Samsung physical home button with a capacitive multitasking and back key. The tablet is better fit for landscape use as in that orientation the two speakers would be on its sides and sound won’t get muffled. On its sides, there are also a microSD card slot, a micro SIM card slot (only on the 4G LTE enabled model), and an infrared beamer. 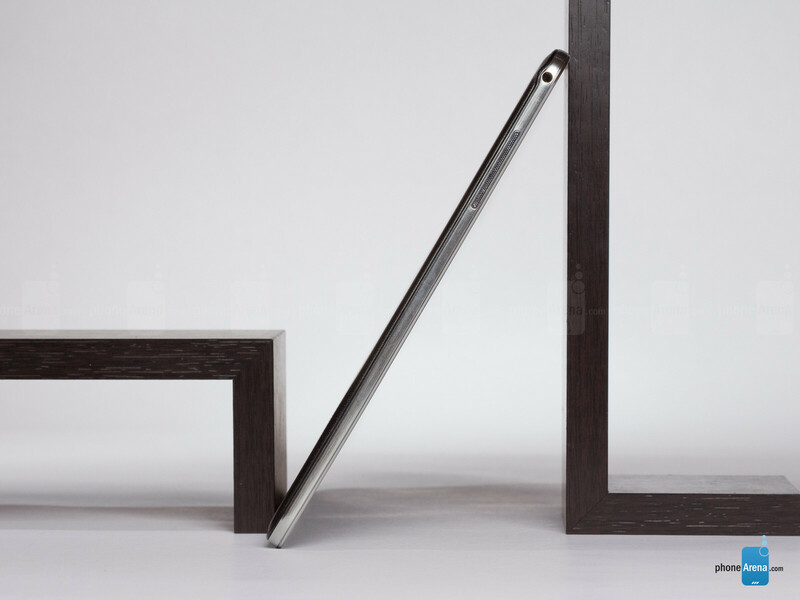 The 12.2-inch display features the highest resolution we’ve seen on a tablet. The gigantic, 12.2-inch LCD display is clearly the focus of all attention in this tablet and it’s an extremely sharp, bright and vivid display. With a resolution of 2560 x 1600 pixels and pixel density of 247ppi, it’s roughly on par with the ‘Retina’ iPad screen in terms of sharpness. We are definitely impressed with its sharpness and viewing angles, but we also noticed that this is not a standard RGB display. Instead, Samsung has used an RGBW Pentile matrix. The W here stands for a white sub-pixel in addition to the R (red), G (green), and B (blue) ones. Unlike them, though, the W does not carry any meaningful color information, and you end up having less color information and a distinctive, slightly annoying, checkered pattern appears in monotone color areas. Colors on our non-final unit seem eye-popping at first, but one quickly understands that they are not accurate by any means. 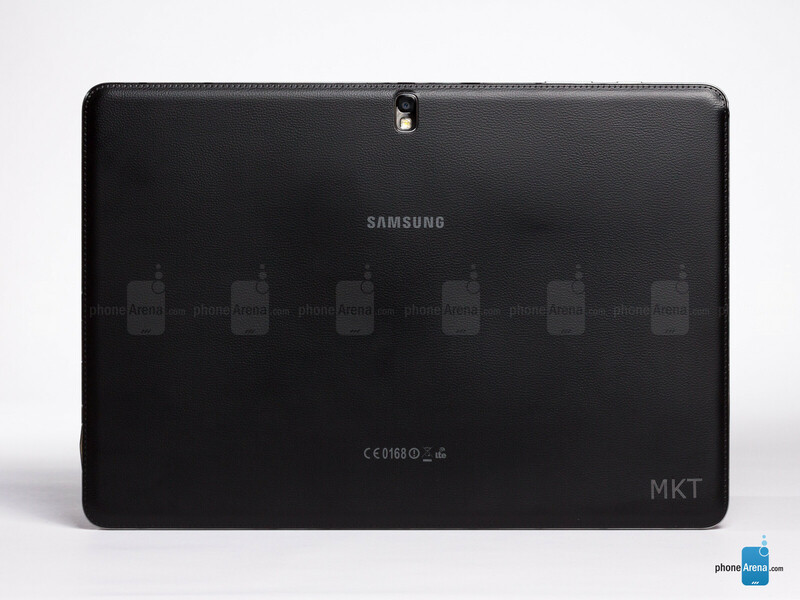 We hope Samsung improves the calibration on the Tab Pro 12.2 in its final version.